The Durability of a design is a key requirement in industry today, as customers expect a robust design. 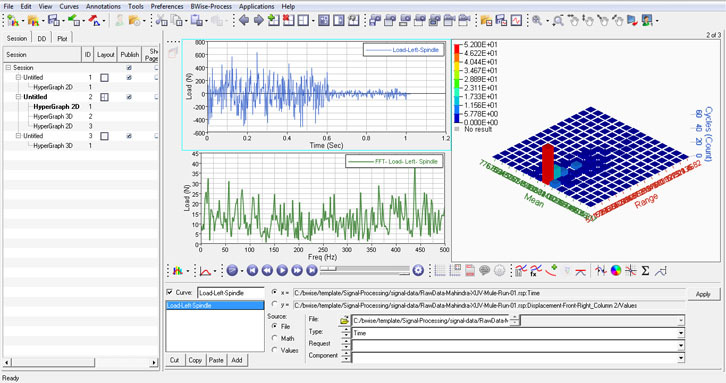 Altair HyperWorks provides load prediction, stress analysis, and fatigue prediction using stress-life or strain-life methods. With increasing competition, durability is an important feature of a product to ensure customer loyalty. Late changes in the design cycle to respond to test results are expensive and create production delays and system risks. Simulating product durability can provide early results and tremendous insight into the design for the product development team while reducing cost and meeting deadlines. Altair can help in many ways to ensure that your product hits the market in perfect shape. 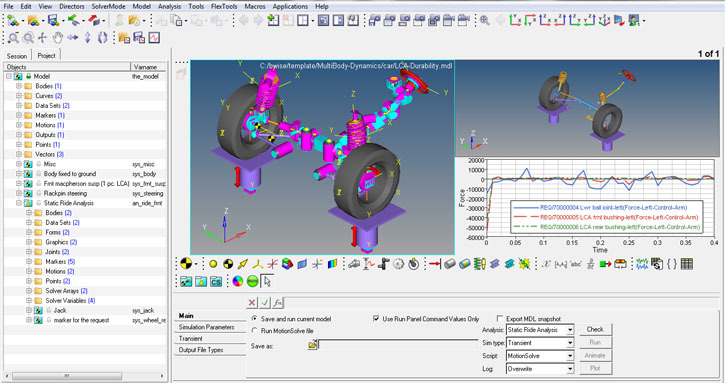 The HyperWorks suite provides excellent tools to prepare, generate and evaluate simulation results. Even without the extensive customization options HyperWorks fits perfectly in your work environment. Ready to use automation templates make your work efficient and help you to focus on the essential goal to produce quality products. HyperMesh, OptiStruct and RADIOSS allow easy modelling and simulation of structures including complex automotive components, lightweight composite designs, and rugged industrial components. Connector features enables FE users to quickly model spot welds and MIG welds using the latest industry standard methods. Users can convert the neutral connector entities to the weld type of their interest. 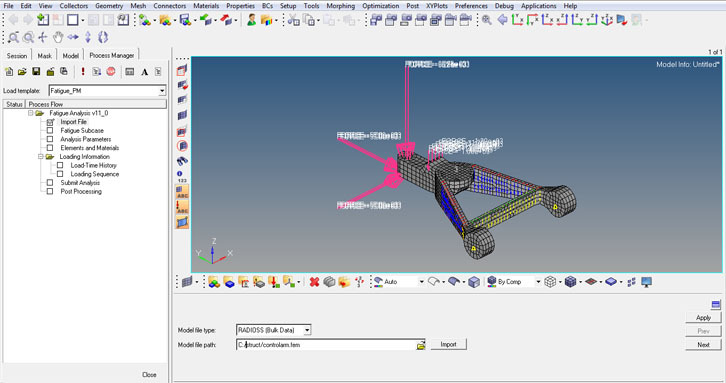 HyperMesh customization framework allows users to create weld macros that enables them to build a complex finite element mesh according to requirement of various fatigue solvers. Fatigue Process Manager template allows users the setup analyses in the RADIOSS fatigue solver. 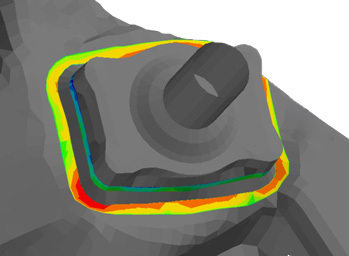 OptiStruct solver supports combined static stress and fatigue analysis in a single run. 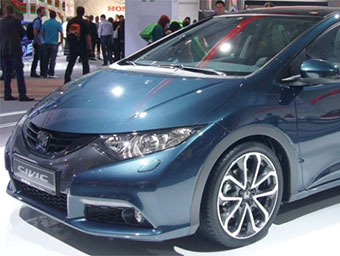 It can perform industry standard stress and strain life predictions. Altair OptiStruct can perform fatigue optimization in a single environment. 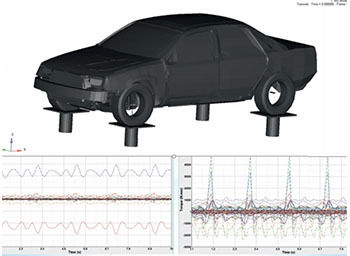 HyperGraph is a versatile durability signal processing utility for test and CAE data analyst. 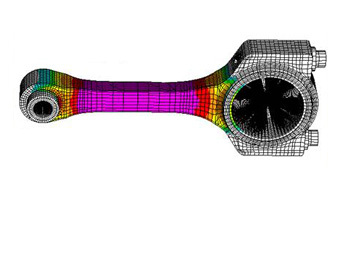 With its powerful math engine, it enables durability engineers to load/stress/strain data. It has the capability to handle a huge amount data frequently encountered by durability engineers. HyperGraph automated report frame allow durability analyst to run through the same set of durability analysis with multiple set of Test loads. User can publish the reports in HTML and PowerPoint. HyperView is a complete post-processing and visualization environment for finite element analysis, multi-body system simulation, digital video, and engineering data. HyperView combines advanced animation and XY plotting features with window synching to enhance results visualization. The powerful Expression Builder can build custom math functions such as Factor of Safety, Target Life and various failure criteria. Complex Linear Elastic to Elastic-Plastic conversion can be done writing a custom Neuberisation function in Result Math. The Linear Superposition tool can be used to linearly superimpose peak static loads and estimate the Factor of Safety on worst loading conditions. The compact Altair H3D result format allows engineers save disk space without comprising on information. Altair H3D is being standardized as preferred input format to commercial fatigue solvers such as FEMFAT and nCode. Custom hot spot utilities can be used diagnose critical regions. MotionView and MotionSolve together are world class Multibody Dynamics solution which can be used to derive virtual loads. Durability Engineers can use this technology today to accurately predict loads on components, which have been physically impossible to a test engineer. MotionView provides direct interface to various test data format as input such as DAC RSP and ASCII files. 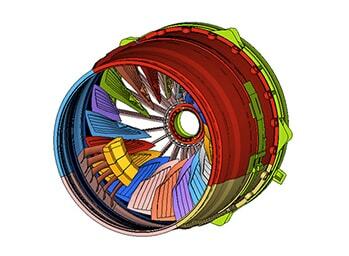 This allows CAE engineers to directly import processed test data without intermittent file conversions. HyperWorks Automate is an advanced process based tool that enables the creation of a repeatable, scalable process in the Altair HyperWorks desktop environment. It includes several building blocks that can be assembled into a sequence that can be executed several times. Own building blocks can be added, making it a powerful customization tool. CAEfatigue VIBRATION from CAEfatigue Ltd. is a powerful frequency domain random response post processor (with connections to NVH) and secondly, a unique vibration fatigue solver that works with both mixed random (Power Spectral Density) and deterministic loading sources in a way not currently possible with existing products. 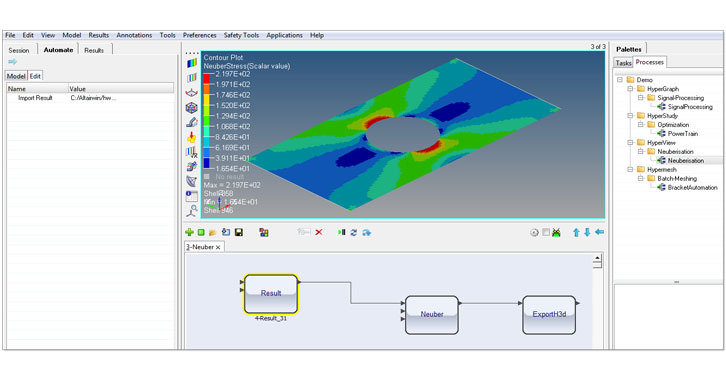 DesignLife from HBM nCode is an up-front design tool that identifies critical locations and calculates realistic fatigue lives from leading finite element results for both metals and composites. Users can go beyond performing simplified stress analysis and avoid under- or over-designing products by simulating actual loading conditions to avoid costly design changes. 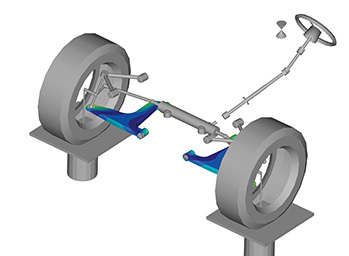 FEMFAT from Engineering Center Steyr offers fatigue life prediction of all vehicle components (engine, gearbox, chassis, frames, car bodies and structures) and machinery equipment based on Finite Element Analyses (FEA). Additional to consideration of complex multi-axial loadings, an assessment of welding seams as well as spot welds and self-piercing rivets in steel and aluminum can be carried out. Components undergoing thermo-mechanical loadings can be assessed by considering effects of material plasticity, elevated temperature (oxidation) and creep.